The Vive mobility bag is a rollator accessory that allows you to transport items with ease. Its pockets are easy to open and secured with zippers for extra protection, and features a waterproof material that ensures all of your items stay safe and dry when they are placed in the bag. Protected by a 60-day warranty. FITS ANY STYLE ROLLATOR, WALKER OR WHEELCHAIR: Quickly and easily secure the durable rollator bag on any style rollator, walker, wheelchair or transport chair with two adjustable Velcro straps. A padded shoulder strap is also included as a convenient alternative for caregivers or loved ones. The large rollator bag measures 12" wide by 12" high by 4.5" deep. HANDS FREE STORAGE: Walker tote provides plenty of storage for everyday life or travel. The front of the tote bag has three convenient outer pockets providing easy access to everyday items such as drinks and snacks, glasses, electronic devices and more. 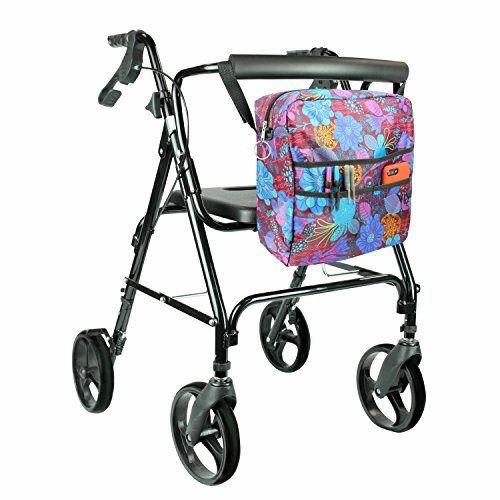 Two mesh pockets are located on the back of the rollator bag for additional storage. The large zippered interior bag easily holds a purse, a change of clothes, or necessary medical supplies. LIGHTWEIGHT AND WATERPROOF: Constructed with a durable, lightweight nylon material, the rollator bag features double-stitched seams to remain sturdy with extensive use. The durable bag is also water resistant to keep contents safe and dry. A large, easy to use o-ring zipper pull allows the contents to be accessed quickly and easily. MACHINE WASHABLE: Sturdy nylon material is machine washable for added convenience. For best results, machine wash in cold water and allow the bag to air dry. Lumex 8220166 Basic Wedge Cushion, 16" x 16" x 3 1/4-4"